In summer, activities in and around the water are great fun, but sometimes can be dangerous. Accidents can happen anywhere – at a friend’s place, at the beach and even in your own backyard. Even if you are a competent swimmer, you can sometimes find yourself in trouble around water, so make sure you are aware of your surroundings before you enter the water. Stay safe this summer! ● Always swim between the red & yellow flags at a patrolled beach. ● Always swim with a friend. ● Never drink alcohol before going for a swim. ● Check with a lifeguard and read the signage to understand the water conditions. ● Obey the directions of the lifeguard. For Lifeguard top tips click here. ● Never turn your back on the waves. ● If you get stuck in a rip (a strong current), don’t panic! Raise your hand and wait for lifeguard help. 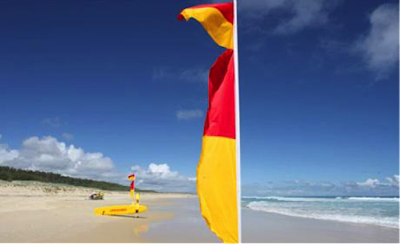 For more information regarding the conditions at the beach you are visiting go to //beachsafe.org.au/. If you would like to improve your confidence in the water, so you will feel more comfortable in the water at the beach, enrol into our Adult learn to swim and water safety program at Monash Sport. Monash University students can also register to participate in the Summer Splash at Sorrento on Saturday 5 March. Visit beautiful Sorrento on the Mornington Peninsula and enjoy a day of fun and games with the team from Lifesaving Victoria. If you are interested in competing in any of the open water swims, triathlons this summer, get some additional training in by attending our Swim Fit sessions (open to Aquatic and Fitness+Aquatic members, casual passes are also available).